Last semester brought big changes to American River College with the installation of 15 new solar-powered trailers across its three campuses, and now faculty is looking to improve the accessibility to these devices. The trailers on campus have three varieties: LED light poles, outlet stations, and electric vehicle chargers, and are worth a total value of over $2 million, according to the [email protected] website. Don Reid, ARC’s printing services supervisor and campus sustainability representative, initiated the process of receiving the trailers in 2014, at the California Higher Education Sustainability Conference (CHESC). Solar-powered outlet stations, along with sets of picnic benches, have been placed in each the Portable Village, Computer Math Complex, and near the stadium. The tables can be used for charging phones, laptops, and other devices. 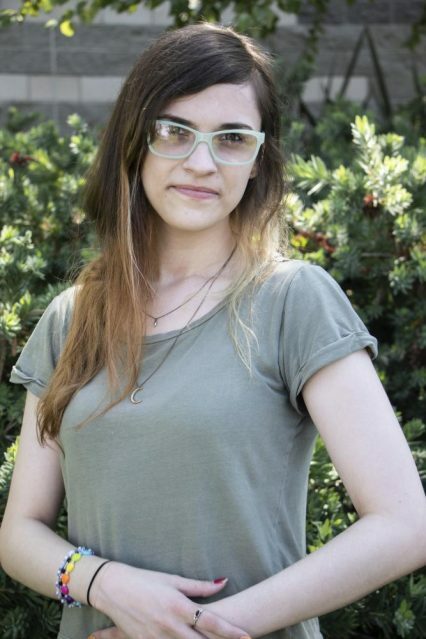 Tabitha Hopkins, an anthropology and biology major, told the Current last semester that she hopes to see more of the outlet stations around campus in the future. While the new benches are readily available to any passerby carrying a phone or laptop charger, the electric vehicle charging stations can only be used by opening a phone app, ChargePoint, to unlock them. Vehicle charging stations are usually accompanied by a fee for use, according to Reid, however drivers will find that the solar stations on campus are free. Despite the convenience of free electric vehicle charging, some students and faculty have found that they have trouble parking and accessing the stations. Non-electric cars are free to park next to the chargers, because there is no designation for electric vehicles. The spaces next to the stations will eventually be painted and labelled to reserve them for electric vehicles, though currently the process is held up by the process of painting regulations. “There’s some questions as to whose responsibility it is to stripe everything,” Reid said. 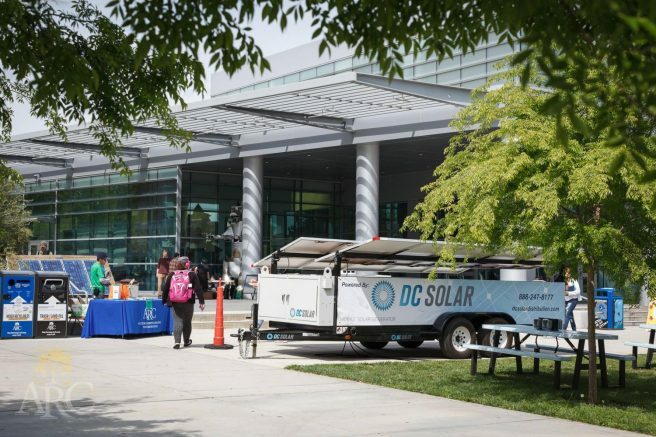 Solar-powered electric car charging stations have been placed on the main campus on the north and south sides of the parking lots, and the Natomas Center and Public Safety Training Center campuses each received an electric vehicle charging station as well. The stations are mobile and workers can move the units to different locations on campuses when necessary to prevent damage. The mobile units were placed on campus with the idea that they would be moved eventually, according to Reid, in order to be more accessible. Repainting the stripes on campus can be a long process, because it must go through the district and contractors, according to Reid. Once the permanent locations of the stations are determined, stripes will be painted to designate their spots so they will be more visible to students. 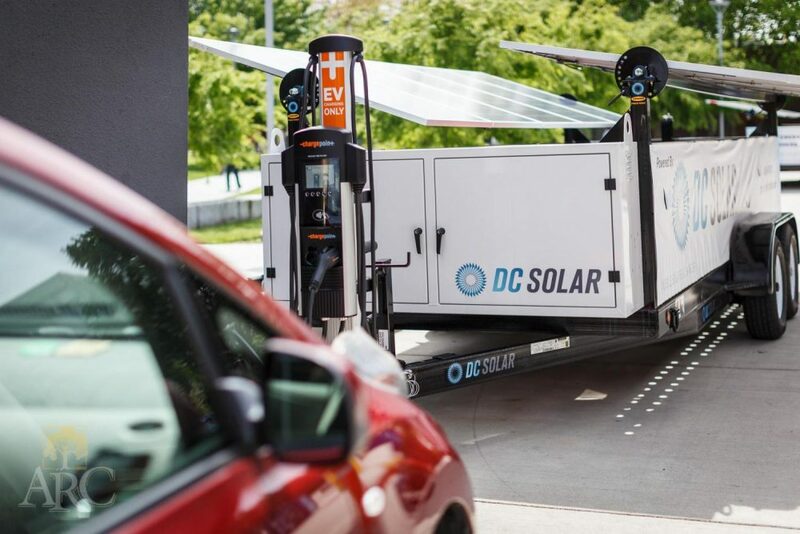 The trailers are manufactured by DC Solar Solutions, a company based in the San Francisco Bay Area that designs and produces solar and hybrid energy powered products. The company also provides regular maintenance for the units when needed. DC Solar was a sponsor at CHESC to promote their services to universities. At first, Reid wasn’t sure if ARC, as a community college, would qualify to receive the trailers, but he scheduled an appointment with the company to visit and survey the campus anyway. The deal had to be discussed with the district office lawyer, and then went to the vice president to review, which took around two years according to Reid. Although legal assisting major Johnny Garcia said he hasn’t used the outlets yet, he enjoys sitting at the tables and says they are more convenient than the library. Even if students aren’t charging their electronics, students like Garcia may benefit having the tables in other high traffic areas. “If I had to pick somewhere, I would say more [stations] by the lunch area and maybe … in front of the library,” he said. According to Reid, any of the other three colleges in the Los Rios Community College District can receive solar trailers for their own campuses since the negotiations were completed. Reid said that signs will be added to the benches for those who are unsure what the outlet stations are or how to use them, and then eventually, umbrellas. Be the first to comment on "Renewable energy powers ARC students"